Product information "Sensor Transmitter for AC transducer"
This sensor transmitter has been specially developed for AC AC converter. Like all other sensors Didactum, also this sensor in the EU is prepared. then this sensor is easily connected to the AC current transformer via plug. 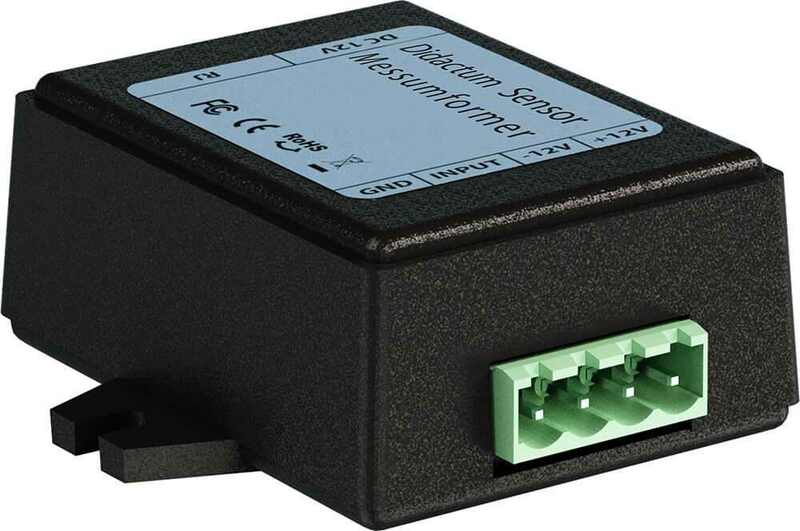 Then you need to connect this sensor with a sensor-free port on your networked Didactum 100/400 / 500 / 500DC / 600/700 monitoring system. aided Didactum measuring and monitoring device is by car ID then the sensor transmitter automatically in WebGUI of your Ethernet listed. You then have to intrude only via a web browser on the integrated web server and can then configure this sensor individually. Set custom thresholds and limit values ​​for the devices connected to the sensor AC AC converter. This offers the Didactum measuring and monitoring system 4 individual limits (Low Alarm / Warning Low / High Warning / High Alarm). When these levels are exceeded the specified limits, you can have from the Didactum monitoring system via email, individual SMS notify (via GSM modem), SNMP Trap or siren with flashlight. All events are recorded in the alarm system data logger Didactum IP. Per SNMP polling, the current measured values ​​of the connected AC AC transmitter also be transmitted via TCP / IP network or Internet. Additionally, you can for the connected transmitter individual conversion formulas and mathematical functions (eg abs, sqrt, exp, In, log, sin, ceil, cos, tan, asin, atan, acos, etc.) and constants (eg pi or e) deposit. The sensor connected to this transmitter (transducer) can be individually named in the WebGUI of IP-based Didactum meter on request. All measured data are recorded by the connected Didactum monitoring systems in the data logger. By clicking can be represented graphically directly in the web interface, the measurement diagrams. the measurement data can be downloaded as a CSV or XML file from the IP data logger with external applications (such as Microsoft Excel, Numbers for Mac) can be edited by clicking. To use, you need the AC current transformer / current transducer (Code: 14099). Related links to "Sensor Transmitter for AC transducer"
Delivery: Sensor measurement converter (transducer). Delivery includes installation material and 2 meters RJ11 patch cable. Supplied without AC measurement converter. Please order separately at Didactum. Customer evaluation for "Sensor Transmitter for AC transducer"